06. Here I think of Saint Thomas Aquinas, who asked which actions of ours are noblest, which external works best show our love for God. Thomas answered unhesitatingly that they are the works of mercy towards our neighbour,even more than our acts of worship: “We worship God by outward sacrifices and gifts, not for his own benefit, but for that of ourselves and our neighbour. For he does not need our sacrifices, but wishes them to be offered to him, in order to stir our devotion and to profit our neighbour. Hence mercy, whereby we supply others’ defects, is a sacrifice more acceptable to him, as conducing more directly to our neighbour’s well-being”. Every Christian is challenged, here and now, to be actively engaged in evangelization ; indeed, anyone who has truly experienced God's saving love does not need much time or lengthy training to go out and proclaim that love. The death of the Lord our God should not be a cause of shame for us; rather, it should be our greatest hope, our greatest glory. In taking upon himself the death that he found in us, he has most faithfully promised to give us life in him, such as we cannot have of ourselves. The Knights of Columbus will be hosting thier final Lenten Fish Fry this Friday in the St. Ben's Cafeteria . Dinner will be served from 5 PM to 7 PM. There is a drive thru on Harlan Avenue for those wishing to pick up meals. Mass is at 5:30 PM followed by the confessions until 6:30 PM. April 12th from 5:30 PM-6:30 PM in the church. The Chrism Mass will be held on April 16th at 5:30 PM at Holy Redeemer Church. The Sacrament of Reconciliation will be available prior to Mass. Social Hour begins at 6:00 PM. Bunco will begin at 7:00 PM. Cost is $5. Please bring an appetizer or dessert to share. RSVP by emailing Pat Miller at pmiller1851@yahoo.com or by calling the parish office at (812) 425-3369. 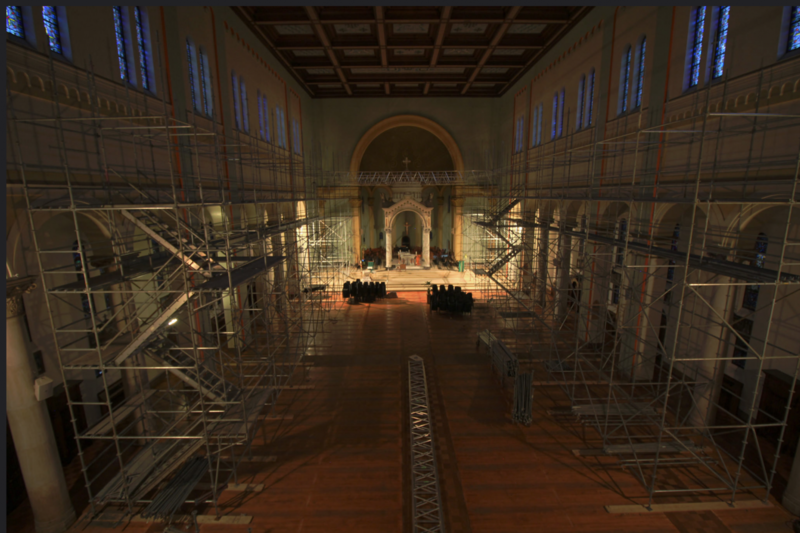 The renovation of our Cathedral has begun. The pews are being removed. During the renovation, the parish will be using chairs. In accordance with the law of the Church and after consultation with Bishop Siegel, we will not be kneeling during Mass until the new pews and kneelers have been installed.